These are mostly an excuse for us to do what we love to do most – which is to create items of consummate beauty, which we hope will be treasured for many generations. These are still in a phase of experimentation and development, and no two boxes will ever be the same owing to the luscious beauty of the woods we use. 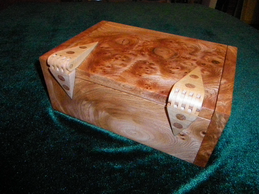 Inside the outer box you will find satin lined inner boxes or drawers. Like most things we make, these are highly individual items – and if you would like to talk about having something specific made then please contact us. We will place finished items in our gallery, together with a price if they are available.